Showcase your venue like never before. Give potential clients a tour of your property — anytime, anywhere — included with your Premium membership. A 360° virtual tour transforms the way engaged couples can view your venue, providing them with a real life walkthrough of your property. 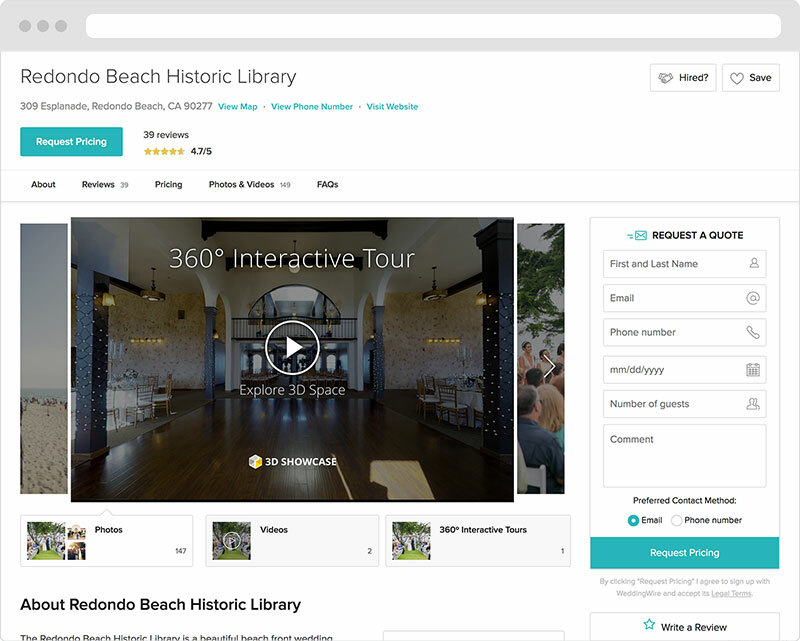 Your WeddingWire 360° Virtual Tour will be featured on your Storefront so couples can tour your property at any time — whether they're across town or across the globe. You choose the locations and featured decor, we'll do the rest. Plus, once your tour is uploaded, your business will receive a 360° Tour icon in the vendor directory. Schedule a photo shoot with our team to get your WeddingWire 360° Virtual Tour — included with your Premium membership. Select the dates and times your venue is available, and we'll contact you to schedule your photo shoot. On the day of your photo shoot, our photographer will capture 3D scans from different locations around your venue. 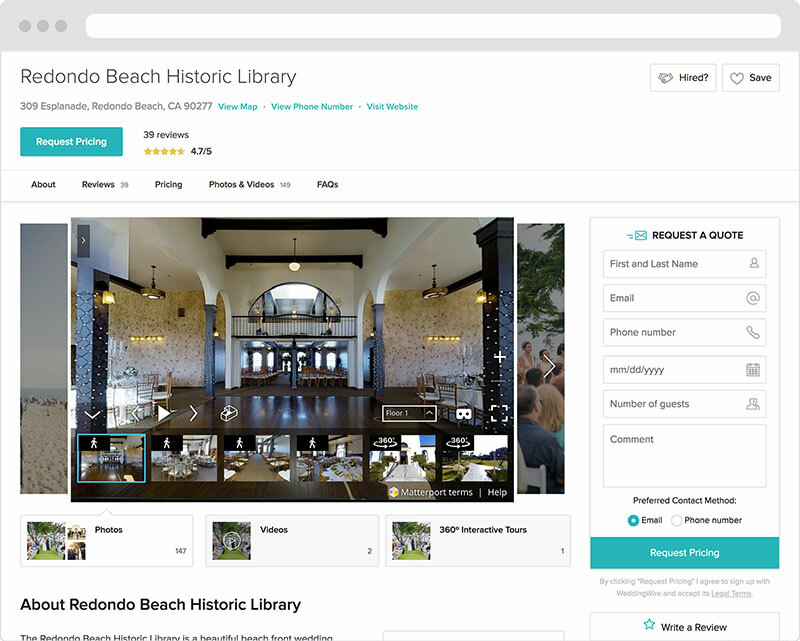 Using the scans, we'll create a high-quality 360° virtual tour of your venue and add it to your Storefront. Fill out the form below and we will be in touch to schedule your appointment. Please select all dates your venue is available for a photo shoot. We recommend filming the tour prior to a wedding (although please note that scanning can take anywhere from 2 to 5 hours depending on venue square footage). NOTE: Selected dates are not guaranteed as scheduled appointments are determined by the photographer's availability. Our team will reach out to you within 2-3 business days requesting to schedule a call to learn more about your space and make an appointment with our photography team. Describe all INTERIOR areas to be scanned and the approximate square footage of each (i.e. Grand Ballroom 900 sq ft, Foyer 200 sq ft). Describe all OUTDOOR spaces to be scanned (i.e. Japanese gardens and fountain in back of the hotel). If available, please upload a floor plan to help our photographers prepare for your appointment. 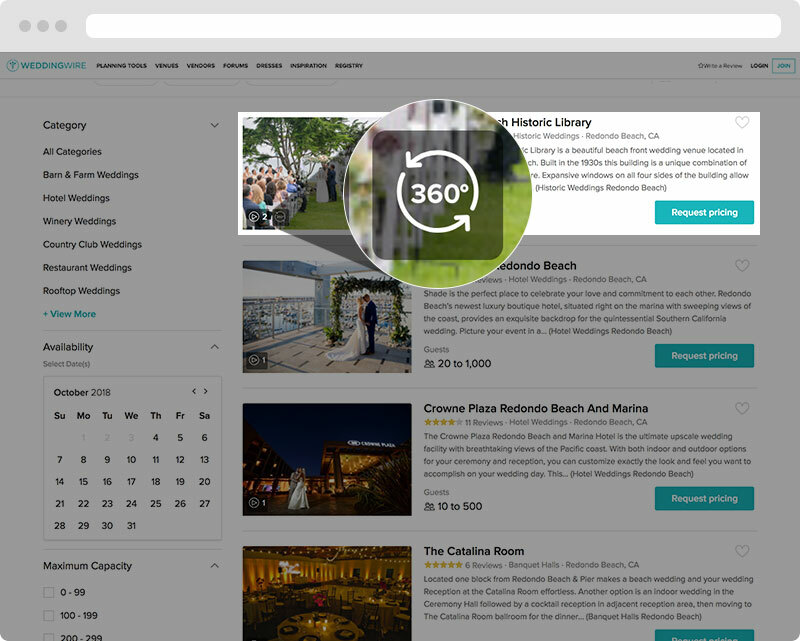 Why should I get a WeddingWire 360° Virtual Tour? Compared to traditional photos and videos, an interactive 360° virtual tour gives viewers the most realistic experience next to physically being in your space, prior to them contacting you. Plus, you can choose to display additional decor to give prospective clients an idea of how your space can be transformed for their big day. 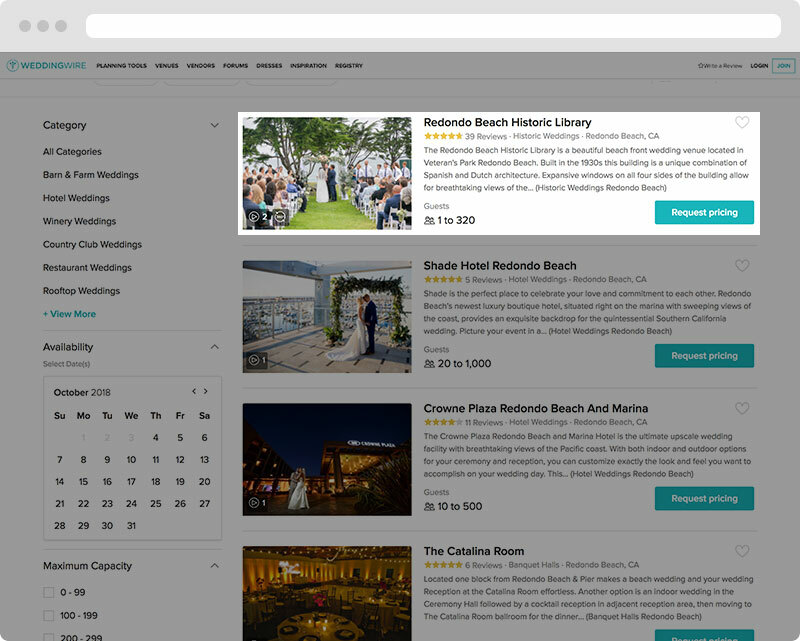 How much does a WeddingWire 360° Virtual Tour cost? WeddingWire 360° Virtual Tours are currently included with your Spotlight, Featured, and Professional venue listing in select regions. Please note that Spotlight and Featured vendors have priority scheduling privileges. Photo shoots typically take 2 to 3 hours, but can vary based on the complexity of your floor plan and square footage. We will calculate the amount of time needed based on the details you provide and schedule accordingly. What should I do before the photographer arrives? We recommend you prepare your venue the same way you would before a wedding — clean, decorated, and well-lit. Keep in mind that the camera will capture rich details of your space for users to explore and zoom. How long does it take to add to my Storefront? After your photo shoot, it will take approximately 3 weeks for your WeddingWire 360° Virtual Tour to appear on your Storefront. Can I add this tour to my website or other marketing materials? Currently tours cannot be exported or downloaded. Please direct prospective clients to view the tour on your WeddingWire Storefront. Questions? Send an email to 360virtualtours@weddingwire.com and we'll get back to you as soon as possible.